Thanks! Noriko Senge also attended. The Imperial Household Agency announced Princess Hisako will visit the UK privately February 13-18. She will speak at her alma mater Girton College, University of Cambridge and visit the headquarters of BirdLife International, where she is honorary president. ETA: Princess Hisako will meet Prince Edward, Earl of Wessex and his wife Countess Sophie. She will give a lecture at the 150th anniversary of Girton College's founding on February 15 and receive an honorary degree. She studied archeology at Girton College from 1972-75. Perhaps it is an issue of translation, but it confuses me that a visit announced by the IHA and involving a public lecture and a meeting with foreign royalty is described as "private". What is the difference then between a private and a public visit? I believe the IHA considers an overseas visit official/public service when formally invited by a foreign government. A trip for Girton College's 150th anniversary, plus a visit to her patronage BirdLife International and what appears to be a private meeting with the Wessexes apparently doesn't count as an official/public visit. Princess Hisako's visit to Russia last year for the World Cup was probably "private" as well. IHA stressed she travelled in her capacity as honorary president of Japan Football Association and wouldn't meet key Russian figures. On February 22nd, Princess Hisako attended the Takamadonomiya 2018 Hockey Japan League award ceremony at the Tokyo Dome Hotel in Bunkyo, Tokyo. She is Honorary President of the Japan Hockey Association. Princess Hisako received members of the Canadian Japanese Leadership Program in February 2019. On March 1st, Princess Hisako attended the Japan Swiss Spring Ball 2019 at the Imperial Hotel Tokyo. On February 21st, Princess Hisako attended the 5th International Research Forum on Biomechanics of Running-specific Prostheses (IBRSP2019) at the AIST Tokyo Waterfront ANNEX. Princess Hisako visited Kyoto From March 9-10 for the Emperor's Cup the 30th National Wheelchair Ekiden competition. On March 16th, Princess Hisako attended the 26th Emerald Ball at Hotel Gajoen Tokyo. The St. Patrick's Day charity gala benefits the Peter McVerry Trust in Ireland and the Support Our Kids Charity in Japan. Girton College uploaded Princess Hisako's lecture about Netsuke on February 15! ETA: Sometime in March, Princess Hisako visited an exhibition at the Lotte Arai Resort in Myoko City, Niigata Prefecture and she received a copy of the picture book "Suwa-sama monogatari"
On March 17th, Princess Hisako attended the ANA CUP 43rd Japan Handball League-Playoffs at Komazawa Gymnasium in Tokyo. ETA: Tatiana Iosiper, Romanian Ambassador to Japan, posted photos of 2019 Japan Grand Prix International Orchid and Flower Show on February 15. The ambassador met Princess Tsuguko, Noriko Senge, and Hisanaga and Takako Shimazu (Takako is Emperor Akihito's youngest sister). On March 25th, Princess Hisako received David Byng and Cheryl-Ann at the Takamado residence; their discussions included conservation and youth. David Byng is an Honorary Consul General of Japan and retired Deputy Minister of the Ministry of Education in British Columbia. I wish instagram allowed text searches instead of hashtag searches. ETA: On March 29th, Princess Hisako attended the opening ceremony of the 83rd Annual Scientific Meeting of the Japanese Circulation Society (JCS2019) and 50th Anniversary of the Japan Heart Foundation held at Pacifico Yokohama convention center in Yokohama, Kanagawa. She spoke about the importance of heart disease prevention. On February 20th, Princess Hisako attended the reception of Nishimura Akira's Asters opera premiere at the New National Theatre in Tokyo. 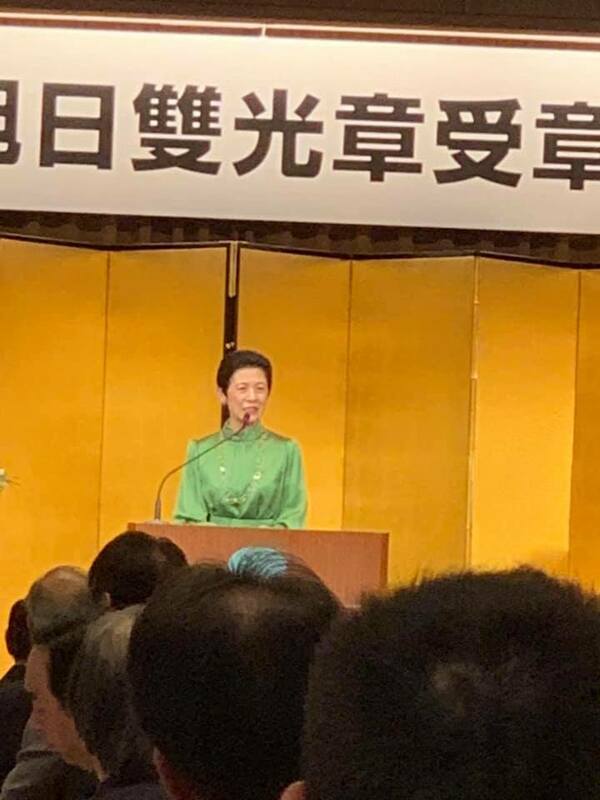 On March 20th, Princess Hisako attended the 21st Chichibu-no-miya Sports Medicine and Science commendation and award ceremony at the Grand Prince Hotel Takanawa in Tokyo. The photo exhibition “Japan through Diplomats’ Eyes” continues to enjoy the patronage of Her Imperial Highness Princess Takamado for 22 years. [...] This year’s theme is “Reflection on the Heisei Era” to celebrate the prosperity of the Heisei Era. On March 15th, Princess Hisako attended BirdLife International's Spring Gala 2019 at the Ritz-Carlton in Osaka. On March 31st, Princess Hisako attended a celebration for Japanese gymnastics and fencing at Ueno Seiyoken in Tokyo. From April 1-2, Princess Hisako attended the First Canadian Women-only Business Mission to Japan. She attended a luncheon at Meiji Memorial Hall on April 1st and a reception at the Canadian Ambassador's residence on the 2nd. Princess Takamado will be in Sweden on 16th May. Crown princess Victoria holds an audience for her. Exciting! and there should be photos from the SRF! I have low expectations from Japan's media. Maybe a report that "Hisako-sama left for Sweden on day X and returned to Japan on day Y." On April 12th, Princess Hisako attended the 30th anniversary ceremony of the Yokohama Museum of Art in Yokohama, Kanagawa. On March 8th, Princess Hisako attended the opening ceremony of the 73rd JOGA Annual Orchid Show and private exhibition at the Showa Memorial Park Hana Midori Cultural Center in Tachikawa, Tokyo. Princess Tsuguko's English in her speech at the International Orchid and Flower Show 2019 on February 15. Here are timestamps and I transcribed the English parts. Video by a Russian attendee. 4:40-4:51: "Good morning, it is my great honor to spend this opening ceremony of the International Orchid and Flower Show 2019 here with all of you." 6:18-7:01: … "And last, one of the aims of this international show is to bring countries and cultures together through the orchids and flowers. Of course, what we cannot forget is the great effort of the table displays of the embassies. My mother joins me in thanking Her Excellency the ambassador of Bangladesh, Her Excellency the ambassador of Lithuania, and the wives of the ambassadors of Belgium, New Zealand, Morocco, and Paraguay for putting much time and effort into producing table displays represented in these countries." ...What an election! What a surprise…!! I just wish you a peaceful weekend. When I attended a party, I found Japanese sweets with “ REIWA”, the name of new Japanese era, which will starts in May. And the smile of Princess Takamado. I am always impressed by her beautiful speech in English and Japanese. I believe her work is one of the most precious pillars of diplomatic activity carried by the Imperial family of Japan. On April 15th, Princess Hisako discussed environmental conservation with 5 mascots of the "J-League Bird Party" and JFA officials at the J-League (JFA House). J-League has 18 clubs with bird motifs. The princess is honorary president of BirdLife International and Japan Football Association. On April 20th, Princess Hisako attended the full reopening of the J-Village national football training center in Fukushima Prefecture. A train station also opened nearby. The facility became an operational base for the Fukushima Daiichi nuclear plant disaster from 2011 to March 2017. It partially reopened in July 2018 after renovations. J-Village is the starting point of the Olympic torch relay next March.